The U19A team, with goals from Carlos Polo (known as ‘Peke’) in the first half and Nico González in second half injury time have beaten Internazionale 2-0 in Tuesday’s UEFA Youth League encounter. The result all but guarantees a berth in the knockout phase, and probably as group winners, which would mean avoiding having to go through a playoff. As things stand Barça lead the group with ten points, followed by Tottenham on six, PSV on four and Inter practically out of the running with one. 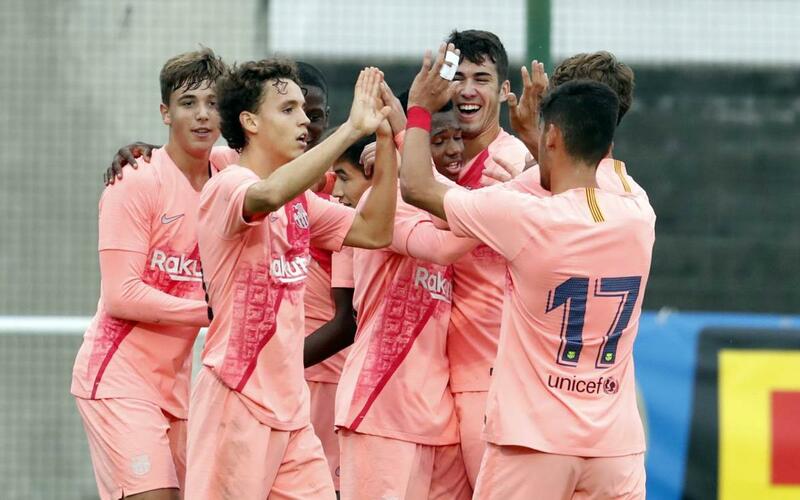 Barça dominated the game from the start, with American Konrad de la Fuente setting up Peke and Jose Martínez also coming close with a header. Inter did have their own chances, and Persyn even hit the post, but Barça’s superiority eventually paid off shortly before the break when Peke converted from a Jandro corner. Inter pushed forward with more verve in the second half, but the Catalans battled hard in defence and Arnau Tenas was outstanding in goal. Chances fell to both sides, and Inter almost had it when the ball was frantically cleared on the line, but Barça held on and eventually made doubly secure of the three points when Nico fired home after an impressive solo run.